Ever been to City Hall, Union Station, or the USC campus? You can thank John Parkinson for that. Parkinson is the architect behind more than 50 buildings in downtown L.A. — despite having no formal architectural training. In a way, he's the city's architectural founder. "I think John Parkinson is so essential to the history of Los Angeles that if you want to understand, and truly understand the history of Los Angeles, you have to understand who John Parkinson is," said filmmaker Stephen Gee, who wrote, directed, and produced a film about the architect. 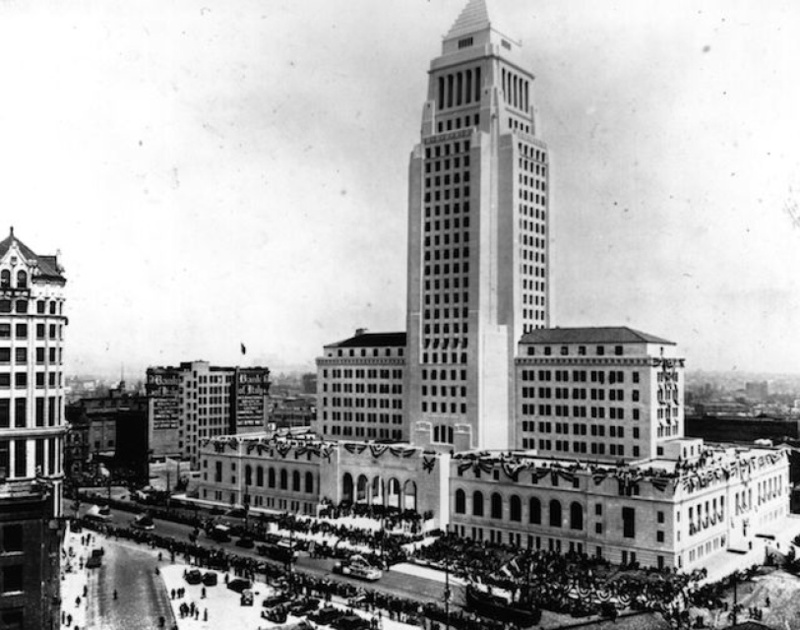 The new documentary, Iconic Vision: John Parkinson, Architect of Los Angeles, premieres on PBS SoCal next Thursday, just in time for the Los Angeles Mayor's Office to officially proclaim July 5 as John Parkinson Day (though it's something that's been done before). But who was Parkinson exactly? He "initially came to the United States with five dollars and a toolbox, just looking for adventure," Gee said. Parkinson became foreman of a sawmill before heading home to United Kingdom, but had trouble making his mark there. So he headed back to the U.S., ending up as a sawmill foreman in Napa. He started building a house, when the landlord saw his plans and suggested he design an addition for the local bank, where the landlord's brother worked. That christened his life as an architect. Parkinson started to build his career on the West Coast before heading to L.A. in spring 1894. There were only 50,000 people in the city at the time. "It wasn't anything like the mega metropolis that we know today," Gee said. "So there were a lot of opportunities. But he basically had, through his own determination, established himself by introducing himself to all the prominent business leaders." He joined the L.A. Athletic Club, where a lot of those business leaders hung out and started introducing himself. That led to bigger and bigger commissions. He designed the building that's now known as Grand Central Market in 1896, the city's first skyscraper that opened in 1902, its first world class hotel that opened in 1906. His trademark: no gaudy decorations. "They're very neat, efficient, classy buildings, that were designed to be beautiful, but not excessively decorated," Gee said. His career spanned decades, with L.A. City Hall being completed in 1928 (and he even kept busy through the subsequent Great Depression). "The main point of what he did at City Hall was just to make a really enormous statement about what was possible for Los Angeles, and really create something that was bold, modern, and assertive, that really spoke to the future potential of the city," Gee said. "One day, the tour guide was just like, 'That's a Parkinson building, that's a Parkinson building, that's a Parkinson building,'" Gee said. 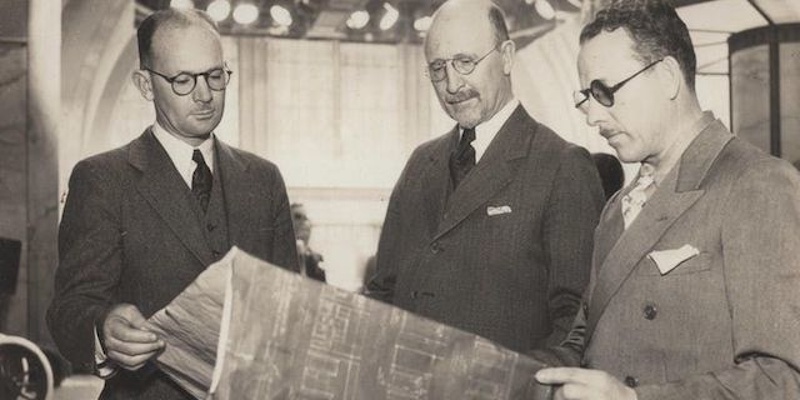 He went home to Google the architect and found a personal connection: he was from Lancashire in England, which is also where Gee's father was from. "To me, it was just incredible, that the majority of iconic structures in Los Angeles were designed by this guy from Lancashire," he said. So, Gee headed to the Central Library to find out more, and when he asked in the architecture section for all their Parkinson books, the response was: "Who's that?" That's when he knew it would make a great documentary. Along the way, Gee wrote a book about Parkinson to help bring attention to him. As an accidental author, he's since written books since then about the Central Library and City Hall. Five years later, the film is finally complete — and Gee is hyped. "It just gives me goosebumps to think that I've worked on this thing for so long now, and to have it screen in really one of the most iconic buildings in California, if not the United States, inside the council chamber ... to get to share that experience in City Hall to me is just going to be a wonderful experience," Gee said. Iconic Vision premieres on PBS SoCal on July 5 at 8 p.m., and you can RSVP for Wednesday's City Hall screening here.